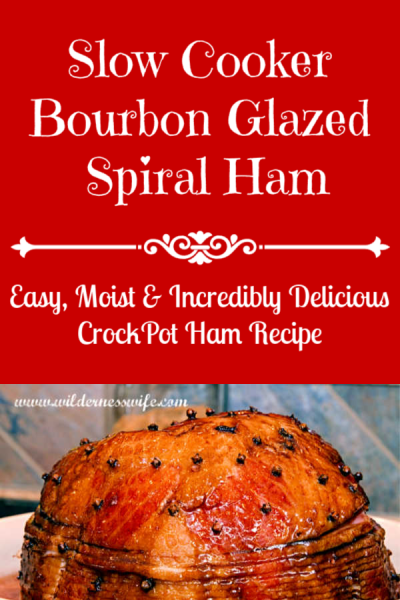 Without a doubt, my Slow Cooker Bourbaon Glazed Spiral Ham Recipe is one of my favorite baked ham recipes. The spiral ham leand itself to being cooked in a slow cooker because when a spiral ham is cooked in a conventional oven it can get very dried out. Crockpot cooking will make the ham incredibly moist and tender. 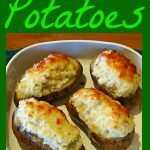 Also cooking your ham in your Crockpot frees up your conventional oven for sides like Twice Baked Potatoes, Scalloped Potatoes, Cheesy Broccoli Cauliflower Casserole or Roasted Asparagus, all great side dish choices to go with your ham. You will need a larger slow cooker that is oval in shape (easier to fit the ham into). Mine is a 8 Quart Crock-Pot Oval Manual Slow Cooker (SCV800-S). I use it a lot to cook whole chicken, turkey breasts, beef and pork roasts. I personally prefer the Smithfield Double Honey Glazed Half Spiral Sliced Ham which is usually about 8-10 pounds. You may have to trim the ham a little to fit it in the CrockPot. Just wrap the trimming in the foil and keep in the refridgerator. They’re great for chopped up for omelets, or ham salad. The Smithfield spiral ham comes with a “glaze” packet that I use in the creation of my bourbon glaze, but you can just add a little honey to the glaze mix if you buy a spiral ham that doesn’t have a glaze packet. The Bourbon Glaze is a mixture of orange marmalade, Bourbon, Dijon Mustard, Orange Zest, fresh Orange Juice, ground Ginger, and Coca Cola. Be sure to spray the slowcooker liner with a non-stick cooking spray. It will help with the clean up later. Next you pour a 1/2 cup of Coca Cola in the bottom of the Crock-Pot. 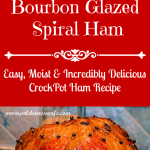 Place your spiral ham in the slow cooker and spread the slices so you can pour the glaze preparation on the ham and it will easily penetrate the ham so the flors get into the meat. The sweetness of the glaze adds the perfect touch to the saltiness of the ham. You will cook the ham on the low setting for 3-4 hours until it reaches an internal temperature of 140°F – 150°F (use a meat thermometer to check). Resist the urge to keep checking the ham and leave the crockpot lid on. Everytime you take it off, heat and moisture escape slowing the cooking process. When the ham is done carefully remove it from the slowcooker to a platter and tent it with foil while it rests. Pour the liquid from the slowcooker through a strainer into a saucepan, heat it as you add a cornstarch slurry to thicken it into a delicious sauce to serve with the ham. Use 2 tbs. of cornstarch to a cup of liquid to create a gravy-loke sauce to serve with your spiral ham. 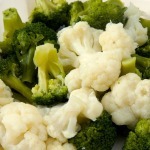 Dissolve the cornstarch in a small amount of cold water before adding it to the hot liquid to avoid lumps in the sauce. Cooking Ham in a Slow Cooker creates a moist and tender final product! Whether its a spiral ham, a smoked ham, or an uncooked ham I always cook mine in a slow cooker. Each type of ham requires a different approach so be sue to check out my other slow cooker ham recipes for a tender , moist ham for your holiday dinner. Glazed with an orange and Bourbon Glaze, this slow cooker ham recipe is moist and absolutely delicious. Spray the CrockPot liner with cooking spray for easier clean up. Pour Coca Cola in the bottom of the slow cooker liner. If using cloves, insert them in the top of the ham and wedge a few between the slices. Mix contents of the glaze packet (or honey if the ham does not have one), orange marmalade, mustard, Bourbon,orange zest, orange juice, ginger and slat & pepper (to taste). Be sparing with salt as the ham is very salty. Cover and Set CrockPot on low for 3-4 hours. till internal temperature of ham reaches 140°F – 150°F. Carefully remove ham from Slow Cooker to platter and tent with foil to keep warm while you make the sauce. Pour liquid from slow cooker through a strainer into a sauce pan. Heat on medium. Make a slurry of corn starch and a small amount of cold water, using 2 tbs. of corn starch per cup of liquid from the slow cooker. Stir over heat until it thicken to the consistency of gravy. I love doing the ham in the slow cooker. I will be trying this recipe. It looks delicious. It is absolutely yummy. 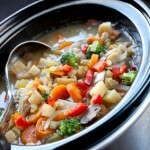 My slow cooker is a life saver for me in my kitchen. I love it in the summer as it saves my heating up the kitchen. On busy days I can get things cooking, have a full day and still put a great meal on the table for the family.